Jeffrey is a disabled veteran of the United States Navy and a long-time pain sufferer. He had been suffering with chronic pain for the past 12 years. Back in 2000, he was diagnosed with Brachial Plexus damage, where the nerve highway from his neck to his upper back stopped firing like a bad spark plug. He went to some of the top Neurologists, Orthopedic Surgeons, Physical Therapists and Chiropractors and they all told him that there was nothing that can be done to prevent the eventual paralysis of the whole left side of his body. This forced him, at the age of 18, to either give up and accept the diagnosis or leave no rock unturned by hunting down a cure. So, naturally, as a researcher – he looked everything up! He read up on his condition, visited industry experts and tried everything under the sun (except for medicine and surgery). He was terrified of becoming immobile, paralyzed or addicted! His doctors told him to keep moving because his health would only deteriorate if he allowed himself to become sedentary. So, he did various types of experiments on himself – by living an extremely active lifestyle. He did triathlons, 100-mile ultra-marathons, 5-mile ocean swims – he was doing a race every weekend and he did this with a broken body. His disabilities soon lead to some severe imbalances, stiffness, pain and immobility. He realized that his imbalances were a result of years of poor sitting, standing and sleeping habits. After years of research and self-experimentation, he discovered some of the world’s top pain relief experts: Pete Egoscue, Jim & Phil Wharton, Robin McKenzie and Dr. Ronald Lawrence. 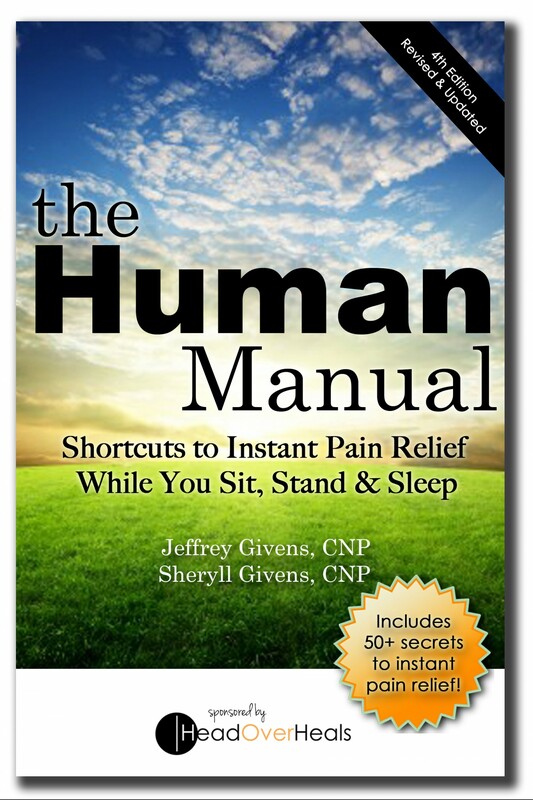 These authors are some of the sources used in our book, The Human Manual. Jeffrey’s new discovery and his passion for helping others were the driving forces behind Head Over Heals. Jeffrey and Sheryll have traveled the west and east coasts of the U.S. as well as Central America to promote their “secrets to instant pain relief.” Today, they continue to educate clients and share their secrets through free seminars and 4-hour Pain Clinics.